Jalan Ngee Heng, on which the DoubleTree by Hilton Johor Baru is located, is more than familiar to me because I used to live on the opposite side of this road. More than two years ago, when hotel general manager, Simon McGrath, took me on a sneak peek of the hotel in its pre-opening stages, I told him that I used to live in this area with my grandparents. My grandfather’s house, a bungalow with an adjacent badminton court, was demolished in 1977 for the construction of the present highway. At the reception counter, I check-in smoothly and the receptionist takes time to advise me about my breakfast options, either the breakfast buffet in the Makan Kitchen or an exclusive spread at the Executive Lounge on Level 29. Aware of how guests may be attached to their handphones, the receptionist also guides me with the simple steps to log into the hotel’s complimentary wireless internet service. Besides handing me the keycard, I also receive a signature giant chocolate chip cookie in its greaseproof packet; it still feels warm in my hand. The concierge staff approaches me to offer help with my luggage bag but I politely decline because it’s really lightweight and I also want the experience of finding my own way to the room. A choice of pillows for me! Walking to the room, my thoughts drift to pillows because I know a good night’s sleep will let me wake up refreshed. Everyone may have a preferred type of pillow for their best comfort and I often advise hotels to stock a range of pillows to offer guests like me, a choice to pick from a Pillow Menu. I step into the room and my eyes are riveted to the welcome note from McGrath on the table. Feeling warmly welcomed by his written note, I turn to find a stack of extra pillows on the bed. I can’t help smiling because the hotel was certainly listening when I told them about providing a choice of pillows! A staycation doesn’t mean I must laze around so I arrange a meeting for 4pm at the Axis Lounge. My friend, Gwen, joins me at the lounge and we are thrilled at the prospect of having our meeting over an elegant afternoon tea set for two [RM58 nett]. We pick our choice of freshly brewed Lively Lime and Orange Fusion tea from the range of Dilmah Premium Tea [RM18] and let it infuse while we talked. It’s all very civilized as we nibble on our tarts, sandwiches, canapes, cream puffs, bruschetta and two types of scones served with cream and jam. Then I am invited by Executive Chef Jaffery Othman to dine at Tosca. I know that chefs are like artists and need to express their creativity and it’s an opportunity for him to create some extraordinary dishes that are off the regular menu. So tonight I’m seated at the poolside terrace, cooled by balmy breezes and ready to be wowed. A visiting photographer, Jeremy Lee, who’s also staying with the hotel, joins me for dinner. Chef Jaffery certainly outdoes himself as dish after dish is served. An appetizer of Goat Cheese Panna-cotta drizzled in tomato essence is followed by Beef Short-rib on sweet potato mash, Ocean Trout with tomato relish, Turkey Ham-Cheese-Pineapple calizone and then a deliciously light pasta tossed in olive oil and butter, garnished with salmon chips and deep-fried basil leaves. I’m sitting back and smacking my lips when Chef Jaffery comes to the table, wreathed in smiles and perspiring quite profusely from his efforts. He graciously accepts my compliments before returning to the kitchen to whip up a delightful macchiato dessert to end the meal sweetly. I’m impressed at how the chef wasted no effort to give me such an amazing dining experience! After a comfortable night, I’m ready for a light breakfast. At the Executive Lounge on Level 29, I’m shown to a table by the window and as I sip my fresh brew of coffee, I’m enjoying the panoramic view of old and new developments in Johor Baru. When I look down, the view directly below is the site of our grandfather’s house! When I share the story behind the name of the road where the hotel is located, I see that it evokes Lee’s interest. I know there’s no better way to share a slice of JB’s heritage with him than to go for a walk through our Street of Harmony and the city’s heritage quarter. Armed with his camera, Lee joins me on a walk down Jalan Ngee Heng that links to Jalan Trus and onwards to Jalan Tan Hiok Nee. He stops every now and then to snap photographs. We pop into the JB Chinese Heritage Museum where the exhibits are the answers to his questions. We slip into Jalan Dhoby and hike up Jalan Duke for a closer view of the majestic Sultan Ibrahim Building and the adjacent Johor Military Forces barracks before heading down the flight of stairs that border Galleria Kotaraya to reach Jalan Trus again. I tell Lee about my visit to JB’s poor man’s pub and his interest prompts me to show him the toddy shop at Jalan Sulaiman. But we arrive at the shop to find it closed. It’s disappointing but this also gives us reason to return again. We make our way back to the hotel and the comfort of the Executive Lounge where we continue talking about the city’s heritage over tall refreshing drinks. A range of 333 well- appointed guest rooms and suites including 20 apartment suites. Swimming, 24-hour gym, steam rooms and whirlpools. Johor Baru’s Street of Harmony and heritage quarter, KOMTAR Johor Baru City Centre, Angry Birds Activity Park and Johor Baru City Square Mall. Non-Smoking Floors, Executive Lounge, 24-hour in-room dining, wireless internet access, in-room safe, walking distance to nearby attractions in the city. Building construction and upgrading road works nearby at no discomfort to hotel guests. On a homestay holiday in a residential area like Delhi’s South Extension Part II, my family and I experienced how locals live. With Delhi as our base, we made day-long sightseeing trips to Jaipur in Rajasthan state and Agra in Uttar Pradesh state. An interesting and intriguing sign! As we walked about, drove around, explored sites, shopped for souvenirs and savoured the delicious cuisine, we became familiar with India’s way of life punctuated by the constant honking in the streets, despite the many signs reminding drivers not to honk! I also saw many signboards with phrases in the English language that smacks of distinct Indian courtesy mixed with a dash of humour and sarcasm. The shopping area in South Extension Part II is a mix of modern department stores like recognizable brands Marks & Spencer and Westfield in their own buildings side-by-side with shops within rows of double-storey buildings and small hole-in-the-wall stores. Parking space is a premium along narrow roads with hardly any space in front of the shops and some buildings guarded their own forecourts jealously to prevent unauthorized parking of vehicles. I paused when I spotted this sign and wondered if I would ever leave my car to a valet to park here and risk coming back to discover that my car was missing? I guess only drivers, desperate for a parking space, may take the risk as they are already forewarned that parking is really at the owner’s risk! Walking pass homes in the residential area of South Extension Part II, we saw how space is maximized by building houses up to three stories high with narrow driveways, usually parked with one or two cars. We spotted this sign on the closed gates of some homes and agreed with this universal issue because there’s nothing more annoying to a driver than an irresponsibly parked car that was obstructing his driveway. These homeowners are giving fair warning because any errant vehicles just risked getting their tyres deflated! Even in India, I like shopping for garments in stores that has fitting rooms so that I can try on for a proper fit before I bought the items. It’s easy to pick choices at a store like Fabindia because the garments are arranged by design types like short or long kurtas. After I made my selections, I head to the fitting room and come to a halt at its door because I had to read the small print on the sign to confirm that the Trial Room was in fact, the fitting room. No, this is not part of a legal courtroom where we go to trial but here the Trial Room is where shoppers try on the garments! The McDonald’s sign is easily recognised even in South Extension Part II but we prefer Indian cuisine so we picked the restaurant situated above it. From the polished brass plaques of the signboard at its entrance, we know this is a posh restaurant and paused to read before entry. It started with the right of entry which is to the discretion of the management, followed by a dress code reminder. We looked at our casual outfits and wondered if we would be refused entry but they were gracious to allow us in. All of us were above age to enjoy a drink with our meal but the final plaque made us realise that it was not unusual for people to walk around armed with guns! Delhi is now connected to Agra by the Yamuna Expressway, a modern dual-carriageway each way designed with three-lanes complete with wide road shoulders and clear signs. As our driver drove us on the comfortable expressway, I can’t help noticing this tongue-in-cheek warning to drivers who are prone to speeding. While it is a stern warning, it’s interesting how a typically Indian courtesy mixed with sarcasm is used here. The words on the sign proves that the authorities are aware that drivers can’t help but enjoy speeding on this expressway but the warning is, over-speeding will invite prosecution! Another strong message posted on a building wall near the toll gates of the Yamuna Expressway, shouts a clear warning to drivers who may be tempted to drive recklessly. The reminder to drive safely is clearly emphasized by the stark comparison between the car’s headlights and the human head. It is such a caustic but clever way to drive home a reminder to drive safely! A great deal of changes have taken place since my previous visit to the majestic Taj Mahal, including a visitor center with carpark and where tour guides approach you to offer their services. This building is situated a fair distance away from the main entrance and visitors are ferried there on buggies. On boarding our buggy, the first things that catches my eyes is the large sign reminding visitors of the items prohibited in the Taj Mahal. Designed with pictorial illustrations, we counted 18 items and made a quick check if we are carrying any such items. The closest item I’m guilty of carrying is not toffees but herbal lozenges. When the security guard checks my bag and finds the packet of lozenges covered in unfamiliar Chinese writing, I must demonstrate a cough to show him that I need these lozenges to soothe my throat. He relented and let me pass! A reminder to visitors who may be tempted to jump in! I can’t help smiling when I read this sign. My imagination soared to scenes in romantic Tamil movies where the male and female lead danced around trees and in such a lovely setting as the Taj Mahal, may even continue with a cavort into the fountains. But the reality is how the scorching heat may tempt visitors to cool off at the nearest water-hole, which happens to be the fountains. There must have been prior incidents that caused the authorities to put us such signs to remind visitors that, Entry in the fountains is prohibited. Traffic was heavy on our drive to Jaipur in Rajasthan state and our driver explains that they have yet to build an expressway on this popular tourist route. We hold our breaths as the driver skillfully avoids the rush of heavy vehicles like trucks and tankers as well as idle cows lying by the road. My eyes are peeled to capture every scene in the local landscape and when we trail behind this coach taxi, my eyes are riveted to the sign on its window. It reminds me that most women in India are still treated as secondary citizens and often abused but it’s heart-warming to see that this taxi operator assures women passengers of their respect. Why such empty shoe shelves? Looks like nobody wants to risk losing their footwear! The sun was beating down mercilessly on our arrival at the entrance of the Raj Ghat memorial park to visit Ghandi’s tomb and when I see that footwear must be removed before entering the park, I hesitate because my feet would be hurt by the heated ground. On the right, were shoe shelves prepared for visitors to store their shoes but they look empty. But on the left, visitors are handing their shoes over to helpers for a fee, I guess, to be responsible for their shoes. When I look closer at the empty shoe shelves, I read the sign that coolly announces that the shelves are provided as free service but at your own risk! No wonder nobody uses this free service! Dubbed the Smiling Bus, the bright yellow Causeway Link buses are living up to their name by bringing more smiles to visitors in Johor Baru through the the Travel Bus Pass. The pass allows unlimited travel for two-day or three-day trips to 31 destinations in Johor Baru and Singapore. It gets better as the service now has a new pick-up point in Kuala Lumpur. From the Swiss-Garden Hotel, a Causeway Link express bus cruises for a comfortable and convenient four-hour ride to two designated points in Iskandar Puteri, Johor. Pass holders will then board Causeway Link coaches on various routes - including five major transport hubs in Singapore - through the Woodlands and the Tuas checkpoints. So here I am at Sanrio Hello Kitty Town in Puteri Harbour, raring to try out the bus’s two-day pass. One of the highlights of visiting Sanrio Hello Kitty Town must be the thrill to meet with Hello Kitty, the adorable cat with a giant red bow, and her charming partner, Dear Daniel. I hear the announcements reminding visitors of the time of the performance so I find my spot opposite The Purrfect Stage, an ideal place to wait for the start of a colourful showcase dubbed the Candy Parade. The lights dim and shifting spotlights herald the arrival of the dancers, wearing colourful costumes as clowns and dolls, whirling and twirling on wave-boards and Segways (motorised two-wheeler stand-on scooters). They dance around in waves of colour, reminiscent of cotton candy puffs. Then comes the moment everyone is waiting for – the appearance of Hello Kitty and Dear Daniel – who dance along in a cleverly choreographed routine. When the dance draws to a close, I join the others to happily receive tiny bags of jelly beans, candy and lollipops handed out by the dancers. As the dancers take their leave, I watch in fascination as fans of the adorable cats patiently wait in queue to have their souvenir photo taken with Hello Kitty and Dear Daniel at the Dream Photo Garden. Over at Wishful Studio, groups of visitors with young children take their turn to join in the fun activities like painting a face on a cookie shaped in Hello Kitty’s head, decorating a small paper-bag with Kitty-themed stickers and colouring a design and having it punched into a souvenir badge. Then it’s time to visit Hello Kitty’s House, a walk-through experience to see her sitting room complete with piano, kitchen, bedroom, bathroom, dressing table as well as wardrobe and accessories. I join die-hard fans in the walkabout and pose for souvenir photos. We are just in time for the ‘Sodor Surprise’ show. Staff ask visitors to make themselves comfortable on the beanbags scattered in front of the stage but I find myself a good spot in front of Barney’s playhouse, directly opposite the stage. This colourful musical performance thoroughly captivated the audience with its songs and dances and when the cast invites the audience to participate, it’s heartwarming to see the youngsters leap to their feet and follow the movements in the action song. Some of the fun rides at Thomas Town are suitable for all ages so off we go to Knapford Station where Thomas Train takes us for a ride around the track. The ones with stronger stomachs try out Colin Crane Drop and Bertie the Bus while the others take a ride on Harold’s Helitours. But everyone just cannot resist the Bumping Buffers Steamies & Diesel Ride and have a go at bumping each other on the dodgem cars! Then I’m back on the second floor to enjoy other attractions with favourite characters like Bob the Builder, Barney, Pingu and Angelina Ballerina. I congratulate myself because I’m at Angelina’s Dance Studio just in time as Angelina starts her class with budding ballerinas. So I join parents and guardians to watch the cute dancers, each dressed in a tulle tutu and mouse-ears headband, trying to follow the simple dance steps led by Angelina! Our group boards the Smiling Bus in front of Puteri Harbour for a short ride to the Mall of Medini where we alight to walk to the Legoland Malaysia Resort entrance. At the mall, we pause to look at the cute Causeway Link ticketing booth, designed as a little coach. I remind my new friends from KL to head to Miniland for a look at the newly upgraded Kuala Lumpur cluster and have fun trying to identify some of the familiar landmarks. From the towering Petronas Twin Towers, Tugu Negara national monument to the archway that leads to Petaling Street, I can hear them marveling at the minute details replicated in Lego bricks! There really isn’t enough time to explore every nook and corner of the resort, so the park map is an excellent guide to get to the activities of choice in the shortest possible time. The Land of Adventure is a must-visit destination for laser-blasting fun at the Lost Kingdom Adventure and a more extreme experience at Dino Island with a splashing log-boat ride! The weather is bright and warm as the group splits up to enjoy various attractions and rides at Lego Kingdom, Lego City, Lego Technic and Imagination sections of the park while I’m reminding them not to miss Ninjago the Ride experience over at the Lego Ninjago World. I was among the first to enjoy this experience when this ride was launched last year and insist that it’s another must-try ride here. At the appointed time to leave the park, we are to meet at the pick-up point in the Mall of Medini to go to our next destination. Everyone is feeling tired but exhilarated and I notice a few who are looking drenched but drying-off after their wet and wild experience at Dino Island! The Angry Birds Activity Park is located within KOMTAR JBCC, a premier mall situated along the city’s main road, Jalan Wong Ah Fook. This is a no-bus route so Causeway Link takes us on a scenic drive to JB Sentral in the Sultan Iskandar Building for our drop-off. A brisk walk through the building with escalator rides and on an overhead bridge leads us into the mall. We follow the signposts with the iconic Red Bird character that points us to the first indoor Angry Birds Activity Park in Asia, located on level three. At the park entrance, we are welcomed by Flock Members featuring Chuck, the yellow canary mascot, in an infectious hip-hop dance routine that gets our feet tapping and ready to head into the park. But first, we are reminded of their socks-only policy so after our shoes and bags are safely stored, we explore the activity park designed with a host of fun activities for everyone from toddlers and kids to youths and adults. At the Red Bird Sona, I see it’s not all about physical actions because visitors are challenged to do mental sums to solve the puzzle before they can leap to the correct answers and score! While the Space Drop Airbag, Anti-Gravity Trampolines, Spinning Time Machine and Air Parkour Track are clearly physical challenges, the Spacemine is an interesting activity that tests our skills in physically maneuvering through a dark cave which is crisscrossed by laser beams! It’s reassuring to see staff posted at various stations to guide visitors as to the fun and safe way to enjoy the activities. I realise that it’s only natural even for adults to succumb to the pull of posing with the display of Angry Birds characters, especially the roaming giant mascots. An outing is not complete without shopping so we use the Bus Pass again at the JB Sentral pick-up point to board the bus to Johor Premium Outlets. At the Information counter, we collect a copy each of the map and directory after which the group disappears in various directions to explore the High Street and Low Street, in search of the best buys. When the group meets again, it’s time to head to the meeting point to board the express bus for the return journey to KL. Everyone seems tired but I there are smiles of satisfaction on those with their hands full of shopping bags. This, we all agree, is a fitting end to a comfortable and convenient trip to a choice of interesting JB destinations with the Bus Pass. The Travel Bus Pass aims to ease the burden of local and foreign visitors who are keen to visit places of interest in JB without the hassle of driving and parking. An introductory promotion offers visitors the choice of a 2-day bus pass at RM46 (original price RM55) and 3-day bus pass at RM66 (original price RM80). Visitors from KL can take advantage of their bundle package of the direct coach service (RM57 one way) in a return ticket deal plus the Bus Pass at an attractive price of RM114 + RM15 for 2-day bus pass and RM114 + RM20 for 3-day bus pass. The express bus service from KL operates a direct route to Legoland Malaysia Resort and Sanrio Hello Kitty Town & Thomas Town at Puteri Harbour in Iskandar Puteri, and return from Johor. Every purchase of Bus Pass comes with an illustrated bus route map and entitles holder to enjoy benefits and discounts at participating travel partners provided in a handy little booklet of vouchers. So all you have to do is to tap the Bus Pass on an electronic gadget at the top of the steps while boarding the bus. Details at: www.causewaylink.com.my or Tel: +607 – 360 2244. Last Saturday morning, my phone rang and a glance at its screen showed that the caller was our hairdresser. I answered with a bit of concern because it was rare to receive a call from the hairdresser! Two sisters, Sau Ying and Sau Leng, took care of our hair since we were schoolkids and are still our family hairdressers. Speaking in Cantonese, Sau Ying went straight to the point. She said her sister was reading the Sin Chew newspapers and showed the article to her. Curious about why I’m mentioned in a Chinese daily, they wanted to confirm if that was really me! All anxiety left me when I realised that this report was from the press conference held with the Chinese media at Think City’s Johor Baru office yesterday. Sau Ying and her sister recognised me in the photo with the report about the Soo Peng Hang Press which caused quite a debate between them about me and the way my name was published! To understand what is going on, let me take you back a few weeks to when Yap Leong of Eh He, told me about what he and his team was doing with the Soo Peng Hang Press. 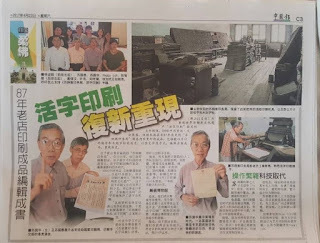 I’m familiar with this old printing business in JB and I remember back in 2015, prior to the Johor Sultan’s coronation, Yap introduced me to Soo Kok Wah of the Soo family, who owns the business, to talk about his Coronation Memories. Since then, Yap and his team had been working closely with the Soo brothers in an effort to preserve the wealth of heritage from the printing press for posterity. When we met, Yap and his team gave me the book’s draft layout for reference. It would be a bi-lingual publication with me providing the English version of the Chinese text. Yap explained their ambitious but worthwhile plans that starts with the documentation of the history of Soo Peng Hang Press – in a bi-lingual book – followed by the physical restoration of the printing press equipment and finally, setting up the printing press for display as a heritage institution. One of the considerations was to remove the ancient equipment to another site for restoration work while the old shop building would be upgraded. And when the building was ready, to install the equipment to its original positions and present the printing press as a JB heritage destination. While Yap was speaking, I was turning the pages of the draft copy laid-out with photos of the ancient equipment in the printing press. As I looked at the photos, I felt a strange connection as my thoughts raced back to my dad. 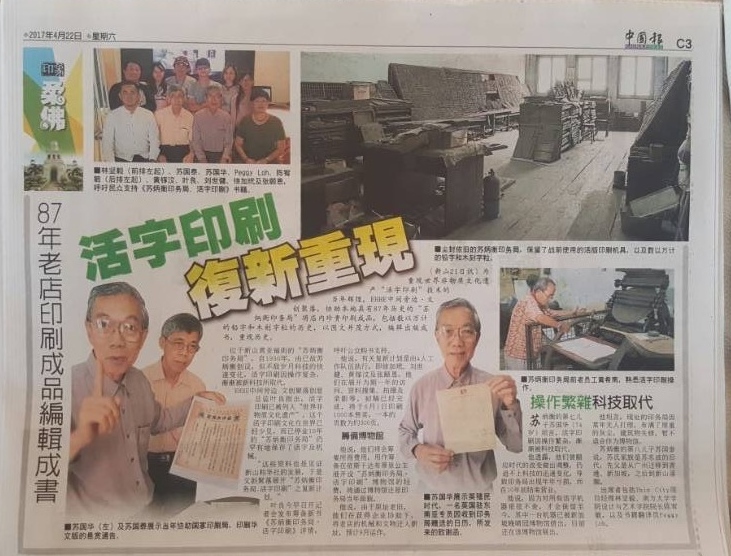 Dad, who was brought up in the Boys’ Home of Elim Gospel Hall in Ipoh, told me that after his school-going years, his first job was as a typesetter with a printing press. He said Mr George Wilson, the missionary who ran the Home, did not like older boys to be idle so dad went out and found himself a job. I can still remember the way my dad explained how he had to manually pick up the types or alphabets to compose the words and sentences in reverse to prepare the plate for printing. Then Yap said that before Soo Peng Hang opened his business in JB, he also worked for a printer in Ipoh! It’s quite an uncanny kind of connection but my dad probably worked for the same printer in Ipoh but at a different time. I figured that if Soo came back to JB and started his printing business in 1930 and my dad joined the printer after his school-going years, it would likely be after Soo had left Ipoh. But there is clearly a connection here! Since July 2016, Yap and his team were doing research on the Soo Peng Hang Press and now they were ready to rope me in to help with the English writing. From their earnest expressions, I could feel their passion for the project and when I shared with them my connection with the printing press through my dad, they were equally thrilled! While Yap is their team leader, the book concept and Chinese text was by Low Shi Jian, who doubled up as photographer and videographer. Wong Kha Mern and See Ca Dai worked together on the book layout and design while the main task for Chong Yii Ern was to translate the Chinese text into English. It was then, left to me to rewrite her raw version of English into proper English and prepare it for publication. While Think City provided a fund for the book project, more funds are needed for the entire project. So last Friday, I joined the Eh He team for a press conference to share information for more awareness and to raise funds for the project. 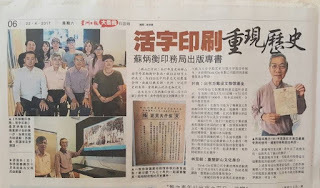 Held at the office of Think City Johor Baru, the event was attended by Think City Programme Manager, Daniel Lim, Assistant Professor, Faculty of Art & Design, Southern University College, Dr Ding Yu Ming, two of the Soo brothers – Soo Kok Wah and Soo Kok Thai – the Eh He team and several members of the Chinese media. While most JB locals would easily recognise the name, Soo Peng Hang Press, many may not know that after 76 years in business, the printing press ended its operations on 31 December 2006 because it could no longer compete with the advancing technologies in printing. The closure of the last moveable type printing press here means another Johor heritage was lost. Yap gave a brief outline of the Soo Peng Hang Press as one of the earliest printing presses in JB which was named after its founder, Soo Peng Hang. Born in Guangdong, China, in 1896, Soo acquired his printing skills from training with master printers in China. In 1924, at age 28, he left Hong Kong alone and ventured South to Singapore. Alone in Singapore, it was always a struggle for new arrivals or sin khek and it was difficult to find a job without a friend’s introduction or reference. Finally, with his savings almost depleted, Soo stayed alive only by drinking water. After a very challenging time, he finally got a job with the Nanyang Siang Pau newspapers. He then worked for Guangming Printing Press in Ipoh before going back to Johor Baru to work in a printing press, located at Jalan Tan Hiok Nee. Later, when the owner of the printing press wanted to give up his business, he discussed it with Soo and decided to sell the printing press to him at the cost of 1000 Yuan. In 1930, the Soo Peng Hang Press was one of the earliest printing presses in JB before World War II. The business was relocated three times, from No.9 Jalan Ibrahim (present-day OCBC Bank) to No. 4 Jalan Tangga Duke (present-day Foh Chong Building) and now located at No. 48 Jalan Wong Ah Fook. Soo Peng Hang Press was not only the most important printing press in Johor Baru that printed many documents as a legacy to many local establishments, it also witnessed the development of Johor as a state and the advancement of modern printing techniques. Lim said that the preservation of cultural identity was fundamental to the rejuvenation of a city’s image and the Soo family’s heritage is an integral part of JB’s culture and heritage. 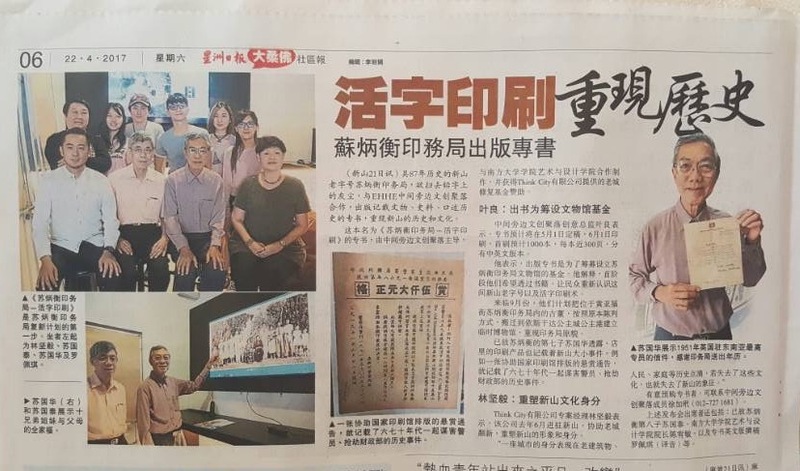 Soo Kok Wah, 74, the seventh Soo brother, said that the JB Tiong Hua Association published an interview with him about their family’s printing press and as a result, representatives from the Beijing Museum contacted him to express their interest to visit the printing press here! He, however, declined to accept any visitors as their former business premises was in a sad state of disrepair. But now with this project in view, the family’s heritage will be preserved – starting with a book – and followed by restoring the equipment. So he was able to tell the Beijing Museum representatives that a visit to their printing press in JB, may be possible in a few years’ time! In the early British colonial period, Soo Kok Wah said very few people printed calendars but Soo Peng Hang Press printed calendars every year and gave them away as gifts. One day in December 1951, they received a letter from a Malay man (probably a delivery person!) and one of the Soo bothers opened it. Soo Kok Wah carefully took out the original letter to proudly show me the typewritten Thank You note with residential address: Bukit Serene Johore Bahru, and the signature of the Commissioner General himself! When Soo Kok Thai, 72, the eighth Soo brother, heard that my dad once worked as a typesetter, he told me that he worked at maintaining modern typesetting machines with the East Asiatic Company (EAC) for 20 years. The media members got their answers and clarifications in a Question & Answer session and at the close of the event, they requested for a formal photo. And their reports were promptly published in the Southern section of Sin Chew Daily, Oriental Daily News and China Press newspapers, the next day. * I'm relieved to learn from my Chinese-reading colleague that my name printed in the Chinese newspapers reads as, Luo Pei Chi, with an indication that it was written based on an English name. Whew! Where have all our playgrounds gone?